* Larger groups - inquire with VBH as to availability. * Off season / Season advance time for making reservation: 30 / 45 days. * Seasonal group pricing may vary from regular pricing; inquire with VBH. * Separate rooms: all beds in rooms to be paid for as group reservation. * Reservation payment at time of Reservation: modifies Reservation Service form, above. Non-refundable. * All group reservations subject to direct confirmation from VBH. No real-time on-line availability. * Season: if other guests or reservations need to be moved or cancelled as result of group reservation, costs associated with this are added charges to group reservation. e.g., in busy times, it may be necessary to block out or move out/not renew guests prior day(s) to enable availability and room allocation. Such block out/move out/non-renewal will be charged as surcharge at check-in. * SHARED ROOMS: 6 - 12 (BUNKS) & roll-away & EN-SUITE & FREE INTERNET. * Minors - in own rooms only; chaperoned only. If separate room(s) required; then applicable private rates used. Relax in your Room with - INTERNET & WI-FI. SHARED ROOMS -- WHAT YOU WANT – IS WHAT YOU GET – in VBH! BEDS have: * shelf for personal items; * light for reading; * outlet to charge phones/computers; * curtain for privacy; * linen. ROOMS have:* Private Bathroom; * phone lockers for overnight; * 10ft /3m high ceilings; * curtain between bunks; * carpeting; * ceiling fan & heater; * closet & lockers. BATHROOMS have: * tub / shower; * granite tops & vessel sinks or pedestal sinks; * granite shelves; * tile or plank floor. * we beat the price/cost of any other hostel in area if you use the internet & eat! Enjoy Venice Beach Hostel life & Enjoy the best value on the Beach! Venice Beach Hostel has a Creative Community Program : contribute your creativity : Everyone Can Win ! All Rooms - private & shared - are small apartments; with their own bathrooms!! All Rooms Have included in room Internet Access (Ethernet) - and included building commons Computers & Wireless Access (Wi FI)!! 2 Common Recreation Rooms: Internet, Piano, Wii; Lockers, TV, Pool Table. Commons Has included COMPUTERS & Internet WI-FI Access!! Guest Laundry Room - available for guests all day & evening long !! Lockers Available; Safety Box Available In Office. Large Kitchen - Good Cooking & Dining Area. BREAKFAST – an egg or fruit (occasional / seasonal), all you can eat Pancakes & Waffles & cereal; home fry potatoes (certain days); or bread. margarine, jam; Coffee & Tea. $3 Spaghetti pot or Chili pot (only some nights) - Pasta & pasta sauce or Veggie Chili & Rice or Fried Rice or (if cold) Soups (some nights). Potatoes,Onions, Oil, tortillas; & Spices, Condiments, etc. You cook for yourself with our food and save over eating out on meal program! (2) Due at check-in: balance of price; tax, refundable security deposit; card use charge is extra. (3) PLEASE NOTE: (a) If you have already contacted hostel directly and we have sent a Reservation Form - you must reserve through hostel and not an outside Reservation Service, such as here. The outside Reservation Service charges us a 15% commission - your “deposit” - to them. Such reservation and/or - deposit - commission is not honored if you had previously contacted hostel and we have sent you our info or sent a reservation info form. (b) Renewals of guests in hostel may only be done in hostel; not through outside reservation services. (4) Holiday Periods (incl. its weekend): added charge in hostel per night. Shared - $3 and Private - $6; added person/private - $3. (5) Prices calculated on per person basis. Amounts due for pricing / charges rounded up to next dollar. (1a) IN SEASON CANCELLATION IS 7 DAYS (NOT 3 days) PRIOR TO THE ARRIVAL DATE (March - October). (1b) NO PARTIAL CANCELLATION of reservation dates / reservation at check-in or in VBH; no cancellation of holidays or holiday weekends dates. (1c) OFF SEASON CANCELLATION is 72 hours (3 days) prior to the arrival date (Nov. - Feb.). (1d) Cancellation only by email or other writing. 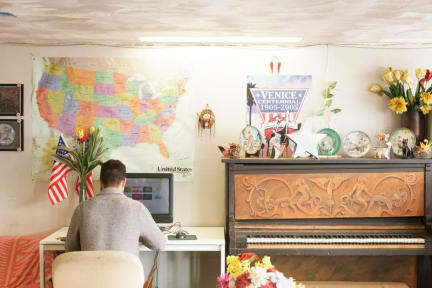 Venice Beach Hostel Rules and Regulations (R&R'S) apply. (1a) In Season Cancellation is 7 days (3 days) prior to the arrival date. No partial cancellation of reservation dates; NO PARTIAL CANCELLATION of reservation at check-in or in VBH; no cancellation of holidays or holiday weekends dates. Off Season Cancellation is 72 hours (3 days) prior to the arrival date. (1b) Cancellation only by email or other writing. (2) Reservations may be required to be fully paid in advance when reserving: (a) with credit card expiring before date; (b) more that 1 private room; (c) 4 or more beds; (d) 1 week or longer; (e) less than VBH cancellation period; (f) in season; (g) third party credit card provided; (h) more than three months in advance. Credit card provided will be used. Refundable deposit will be due at check-in. (3) Debit Card Reservations are to be fully paid upon receipt of reservation and in advance. (4) Children are welcome. Children may only be in private rooms and with parent or authorized adult. (5) Proper & valid picture ID required. International travelers: passport; U.S. Travelers: driver's license. Locals only in private rooms. VBH reserves the right to refuse service. (6) Special rules/limits apply for locals and non-travelers in shared rooms: contact hostel and read R & R's before reserving for shared. This reservation service is only for foreign & out-of state travelers who are continuing travels. All others must contact VBH directly to confirm reservation and verify that they are non-locals & travelers. (7) No Drug Use Policy. No drugs allowed in VBH; no drug use in or about VBH. Immediate removal and no refunds if this is violated. (8) We have a 14 night maximum stay. Any guest booking for longer than 14 nights will have their bookings cancelled. * Special Note Re Our Internet,etc. : It Is an extra Service; We are small, no IT staff & we are not techies - so if it goes down; or machines break do not expect that it will be instantly fixed - or that we can do anything about it during your stay. There are no refunds There is extra WI-FI in Commons and halls. - And To Really Enjoy -- Please Reserve & enjoy Venice Beach and Venice Beach Hostel! 10 % OFF SHARED SPECIAL - or – FREE NIGHT SHARED SPECIAL off season – mid-OCTOBER & NOVEMBER! FREE NIGHT FOR YOU – TO STAY LONGER ! (b) Additional week – Free Night (8th night) Added to your week extension. I have stayed at this hostel twice. Its in a great location right next to the Boardwalk. Will stay here again next time I'm in Venice. Great location. I stayed in a single private ensuite which was clean and very spacious. Comfortable bed. Good value for money. WiFi worked fine. Great location one block from the beach, got a lovely big airy private room with 2 big beds, kitchenette & bathroom. Only there for one night so didn’t use the facilities but saw a big TV room, kitchen & little outdoor seating area which was cute. Only thing I would criticise is the left luggage situation, it was a corner in the reception which was often unattended do anyone could actually come off the street & take a bag, having a locked storage area would be better. When we arrived first person we saw took a $50 room deposit without explaining it- didn’t find out until someone else was on the desk and there was no warning. Not a major issue but takes up to 4 working days to get your money back in your bank so could have done with some warning as we’re on a super tight budget! The price seems a little expensive for a hostel that’s not on the beach. Is a good hostel only for one night is really close to Venice beach, but I think they need to improve their facilities looks very old and tetric some parts, the beds wear clean, the breakfast really nice, as a recommendation they ask you for a 50 USD deposit maybe something you need to consider before make your book or arrive to the property. also the attention and service from the staff its ok. This was the worst hostel I never stayed in my life Dirty, unsafe, no facilities at all, the breakfast it doesn’t exist. The manager was rude and impolite. I payed by cash and then the addebit the amount in my credit card also. Staff rude. All the place is dirty and smell really bad.